These books are distributed to students who sign up for the Kaplan CenterPrep only and they are not meant to be sold in libraries and that's why there's no ISBN number associated with the books. Exception is the Qbook which is available for stand-alone purchase from various online stores and in book shops. These notes have been abstracted and consolidated into one book, they call it Kaplan MedEssentials, this is an attempt from Kaplan to provide students a one-book approach (like the First Aid for the USMLE), the MedEssentials is essentially a collection of the high yield tables and graphs that are seen in the original notes. The MedEssentials books is available for direct purchase from Amazon. However, the MedEssentials book is not as frequently updated as the mainstream KLN. 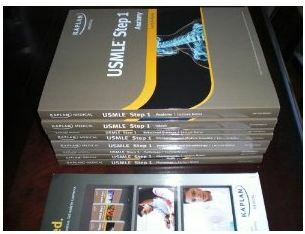 Kaplan Lecture Notes is arguably the most used USMLE Step 1 comprehensive review material along with First Aid for the USMLE Step 1 approach. This holds true for both AMGs and IMGs. Kaplan Medical releases new version of the series every year. 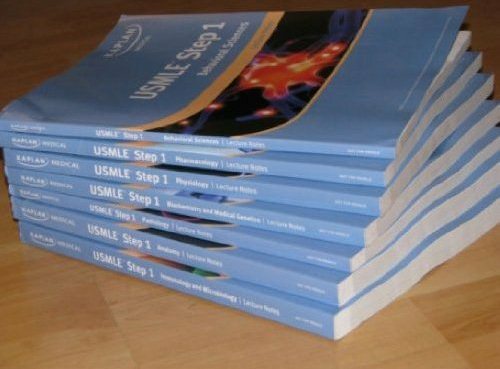 The idea is to have the latest relevant high yield topics that reflect the current style of the USMLE Step 1 Exam. They usually change the color of the outside color with each new release. The newest version (2010 - green ones) is heavily revised. The books are a lot smaller, as they removed the low yield stuff. I'd suggest you get them if you haven't started reading yet. If you're already finished with them, it's ok. You won't be missing a lot; in fact, you've read more. I used the 2007-2008 and they're pretty similar to the ones you have. I have Kaplan Notes from 2004 and i just cross checked with 2010 version. From what I can see, there are barely any noticeable changes. Even the practice questions are the same. It may be either due to no major change in the basics as such or the new version is actually the old version with just the change of cover. I compared my 2008 with my friend's 2010 Kaplan notes. They look exactly the same word by word. Very minor differences, they changed the sequence and arrangements. The notes are changing, not because anatomy has changed but because Kaplan know what questions will come this year and next year and so on and so they focus on the topics that will come in the exam for that year. I have 2008 notes and I cross checked each and every chapter with 2009 and they are the same. But this is not the same for Step 2 CK. My 2008 Step 2 CK medicine notes is 300 pages while the new 2010 is 400 pages, so for CK get the new 2010 but for step1 your 2008 notes is fine. If anyone is using the 2010 or 2011 books, then they will notice that Physio has been revised pretty heavily and we have some changes in the quantity of the material available. I personally feel, that Cardio has to be done from BRS for better understanding of the graphs..
so it doesn't make difference if i am studying from the 2009 version ? I have 2011 series, I advise you to bring the most updated series but really it doesn't matter because all the books have same content by 95% ... so the most important step is to start studying seriously without wasting time. Hello thanks for the post it's helpfull So far 2010 version had major changes from previous versions. How about 2012 compared to 2010? I heard that anatomy topics are rearranged what about other subjects? thanks for the information, really helpful, just a question! Do you know when is the estimated time for releasing Kaplan Lecture Note 2013? since I am gonna take the exam Jan 2014, its important to me . that was the exact question I had: “Differences between the various versions”. Thanks a lot for your post it answers a lot of my questions. I agree. It doesn't matter 1 or 2 year difference from each version, the real point is to start and cope with it. Another thing: Too many different material can be confusing, you don't know which one you should use. Pick the one that suits you better and grab it! . I am going to buy the 2013-2014 lecture notes from amazon but i can´t find the videos, is it vital that you have the videos so you can use the lecture notes or can you study from the lecture notes alone. Also I am going to take the exam in 2015 so I´m assuming having the 2013 notes won´t matter that mutch. Last edited by doly; 07-03-2014 at 08:57 AM. 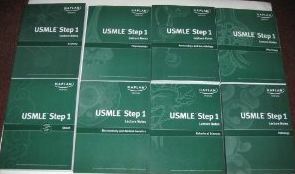 kaplan usmle lecture notes are prepared for students who get the full course prepration of kaplan medical for usmle. if you can afford , pay it and you will get both all 7 related books and its videos. in case you dnt want to pay for the course, you can get the books from amazon(2014 is already available), most of sellers with high ratings are reliable. you can also download corresponding videos by torrent. I hope this is the best place for this question. Please post your answers and explanations. I am particularly interested in the explanations for respiratory resistance. its pretty lame I have to post this 15 times to send someone a private message. I was thinking the same exact thing. Gotta save money where ever we can lol.